Rain rockets, the print on the truck says "increase rain to extinguish fire"
According to Sioux legend, a man once relieved the Native Americans of the North American prairies from a lingering drought by inducing rain with a dance — he was called the rainmaker. Today, in Northern China’s Shaanxi Province, you’ll find little rain dancing here. Instead, the rhythm created by rainmakers of this province is to the beat of hissing rockets droning into the stratosphere. Cloud seeding, or weather modification, is a method of increasing precipitation (namely rain or snow) by releasing highly insoluble chemicals into the air such as silver iodide by ground rockets or specially fitted planes. China implements the largest cloud seeding program in the world. Around one-third of Greater China saw increased rainfall in 2009 due to a record 840 flights carrying out weather modification, according to a report by the Associated Press. If you are like most people, the idea of all those chemicals fizzling around up in the clouds will make you leery. Over time, research hasn’t always answered the hypotheses we’ve aimed for: dramatic conclusions can be drawn from past practices that were once used and later condoned as harmful. At the turn of the 20th century, asbestos was thought to be a handy insulator until it started causing lung diseases, and Coca-Cola contained about 9 milligrams of cocaine. According to the official Expo 2010 website, the Shanghai Meteorological Bureau originally planned on modifying weather during the Expo, but later retracted implementing the controversial method at the international event. An about-face compared to Beijing last October 1, when China’s National Day was marked by the “largest weather modification operation in China’s history,” according to a previous report in the Global Times. When used to ebb droughts, forest fires and fog, cloud seeding can save lives and business. 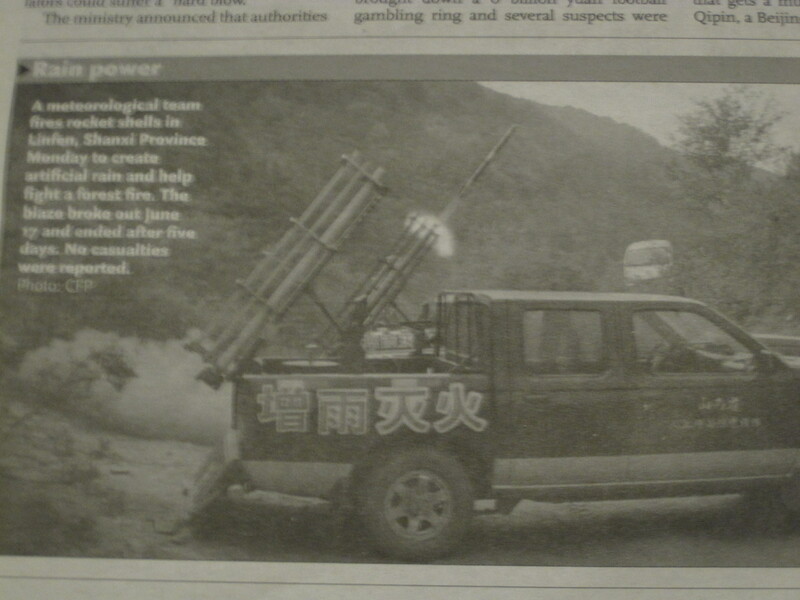 Truck beds full of rockets with the words 增雨灭火 (increase rain to extinguish fire) printed on the side have been used across Greater China’s arid regions to combat dangerous fires. Start creating cloud condensation around cities, and you’ll produce a sunny forecast by dumping rain prematurely. Manipulating the clouds in this way, purely for pleasure, demonstrates a voracious yearning to further dominate every aspect of our planet. Is it really safe to will the weather to our own whim using a science still in the stages of research and development? Well, it all depends who you ask. According to the Weather Modification Association (WMA) in California, the use of silver iodide in cloud seeding “shows no environmentally harmful effects.” The traces of silver found in soil amount to “100 times less than industry emissions.” Always a participant of ecological polemics, Australians are weary of exposing their fragile ecosystem to silver iodide — a chemical which can cause possible residual nerve damage to humans and mammals. Not to mention the possibility of altering seasons and creating accidental floods, such as the recent surge of floods that has submerged three corners of Greater China. We all wish that we could see that blue sky whenever we wanted, or save lives by extinguishing untamable fires. The reality is there is nothing more untamable than ourselves. We are populating at a pace that is placing pressure on our natural resources and the planet that offers them. With all this talk of social harmony, one can hope that one day we will find it with nature as well.